Jerry Heilman, from the Conservation Biology Institute, located a series of historical and current air photographs at Oregon State University's Map Library. 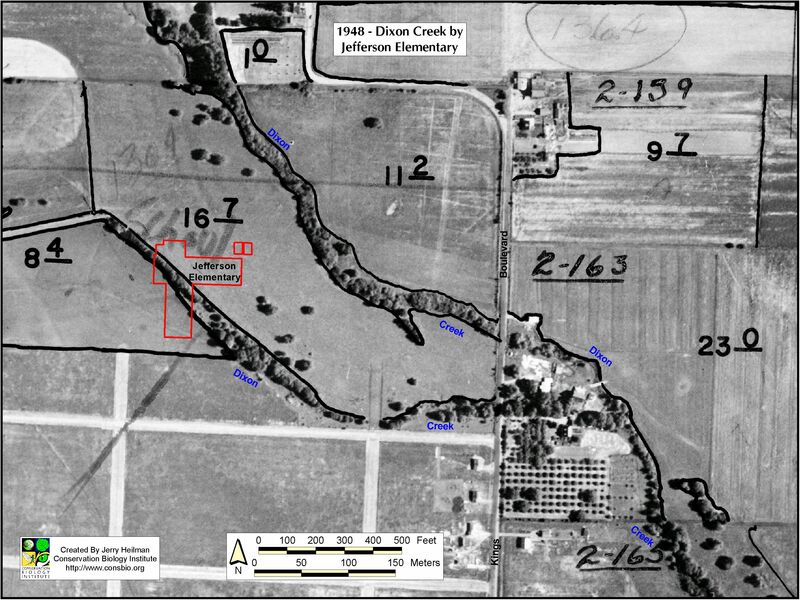 The photographs were scanned and geocorrected so that cumulative change over time can be assessed. To view an animated sequence showing land cover change from 1936 to 2002, click here. To view or download a higher resolution version of a photograph (JPG format about 1,100 KB), click on a photograph below. 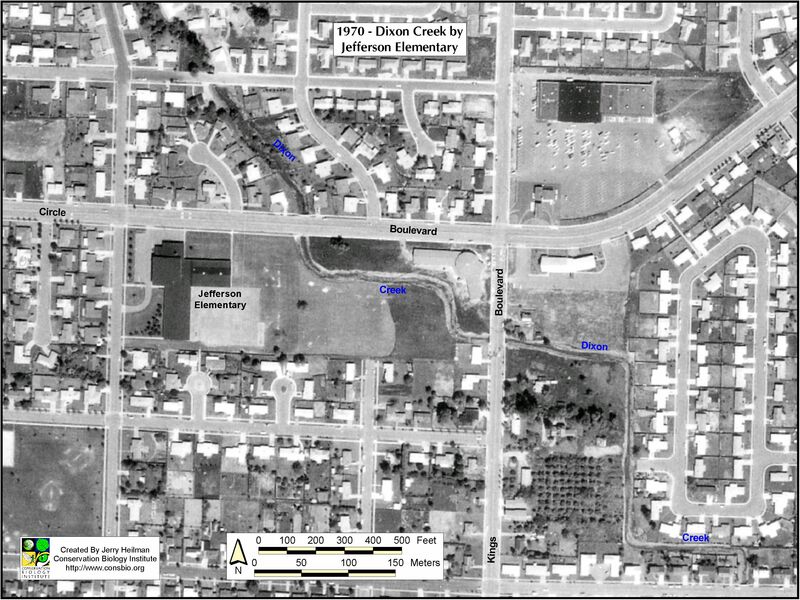 1936 air photo of Dixon Creek near Jefferson Elementary School. 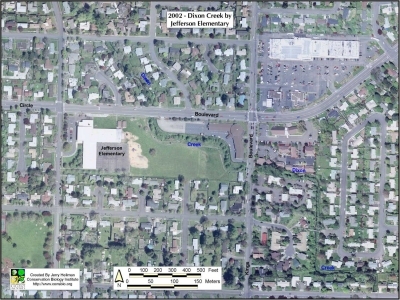 Notice that Dixon Creek has two distinctive channels, one of which ran right through where Jefferson Elementary is now located. 1948 air photo of Dixon Creek near Jefferson Elementary School. The southern channel is more distinct in this photo because of a line of trees along the creek. Also, notice the widening and addition of roads. 1956 air photo of Dixon Creek near Jefferson Elementary School. 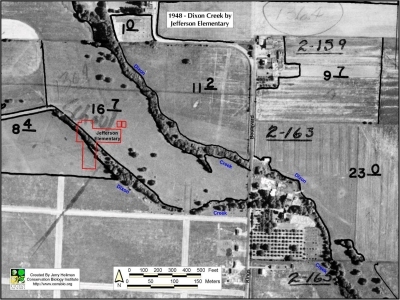 Notice that the southern branch of Dixon Creek has almost been eliminated by farming and housing development. The northern branch is still relatively unimpacted. 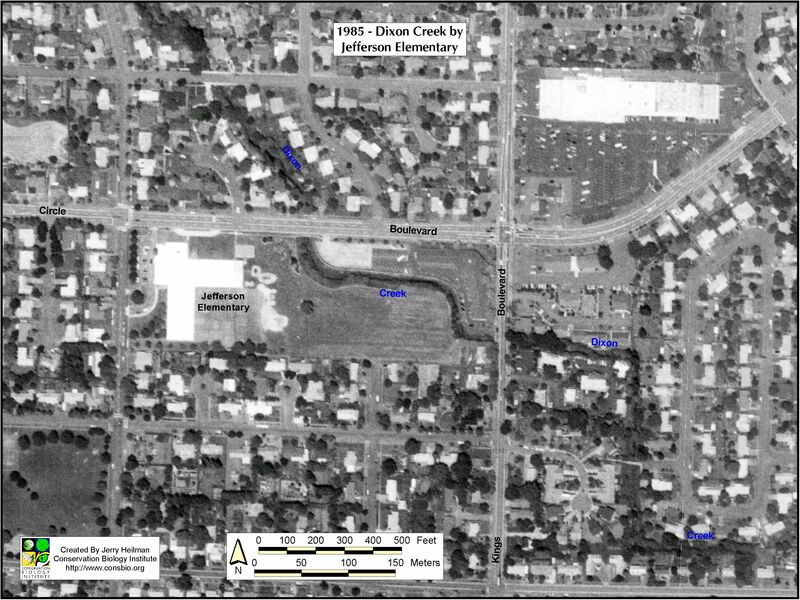 1963 air photo of Dixon Creek near Jefferson Elementary School. Jefferson Elementary is built and the section of Dixon Creek going through the school property, as well as in the housing development to the north, has been straightened and the stream vegetation has been removed. Also, notice that you can still see the original stream bed just a bit to the south of the new artificial channel going through Jefferson. 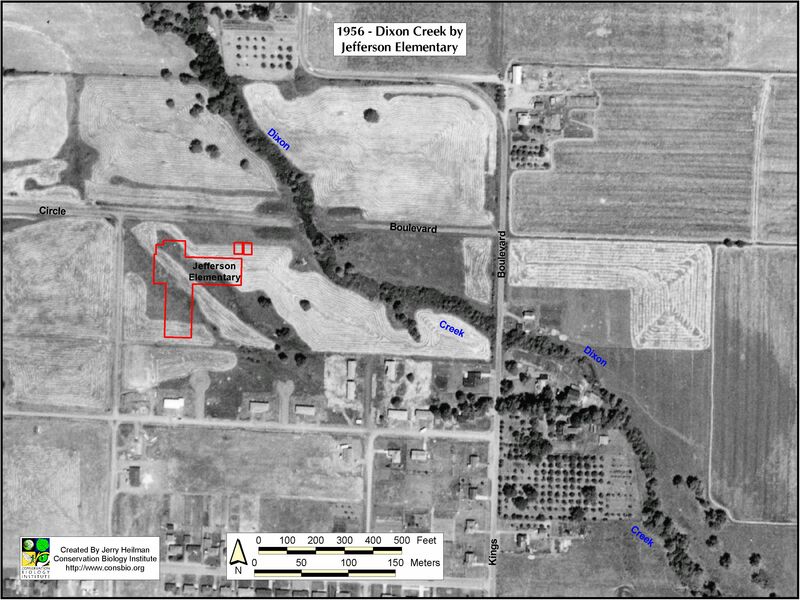 1970 air photo of Dixon Creek near Jefferson Elementary School. 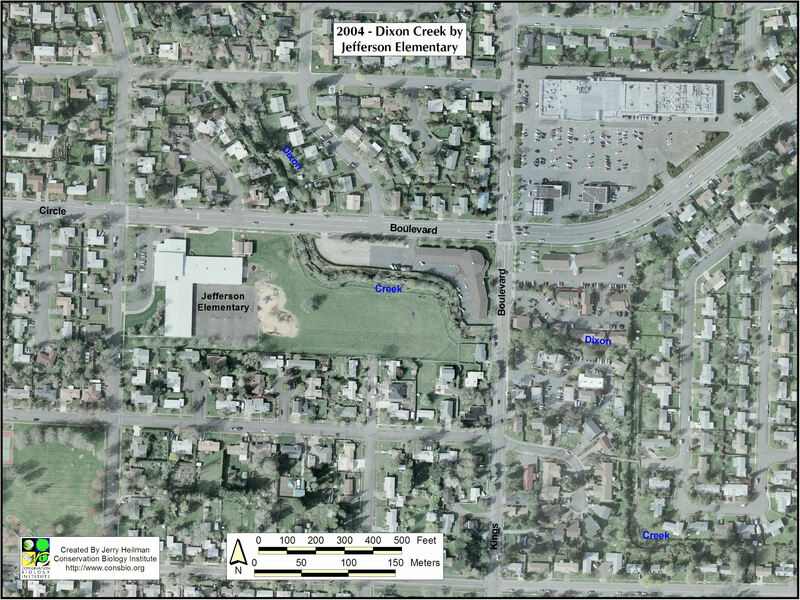 Some stream vegetation has returned, but notice how the section of Dixon Creek to the east of Jefferson Elementary has also been straightened and vegetation removed. 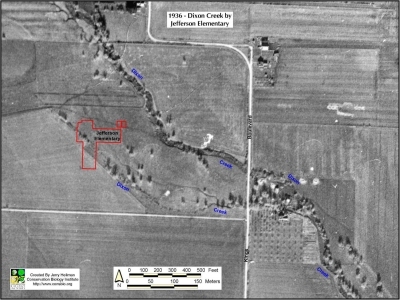 Every section of Dixon Creek seen in this photo has now been severely altered. 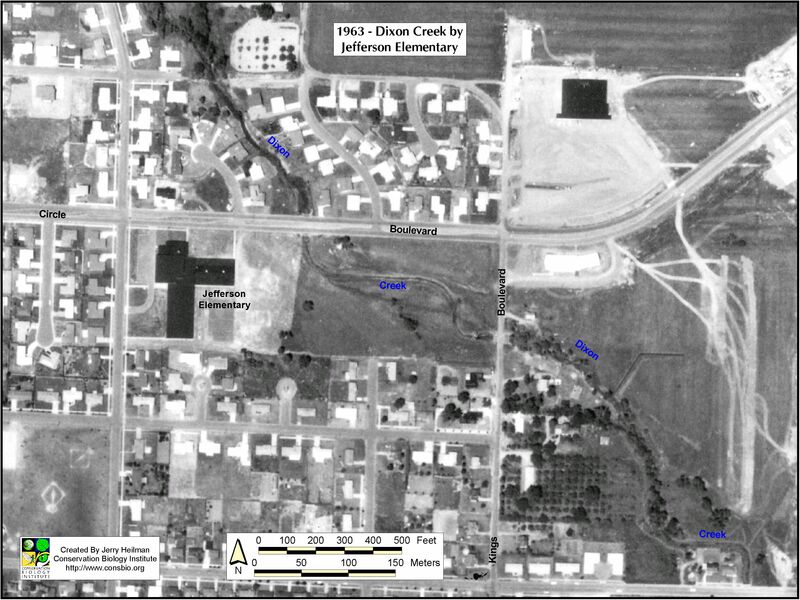 1978 air photo of Dixon Creek near Jefferson Elementary School. 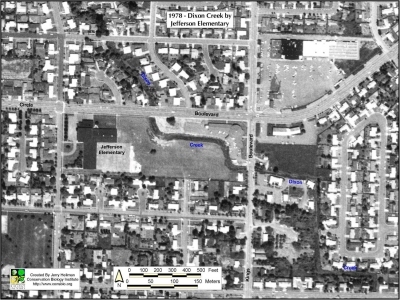 The stream side vegetation has recovered a fair amount, except for the section flowing through Jefferson Elementary's property. 1985 air photo of Dixon Creek near Jefferson Elementary School. Notice that almost every available location for development in this photo has been built on. There is only a single small area in the upper left that has not been developed. 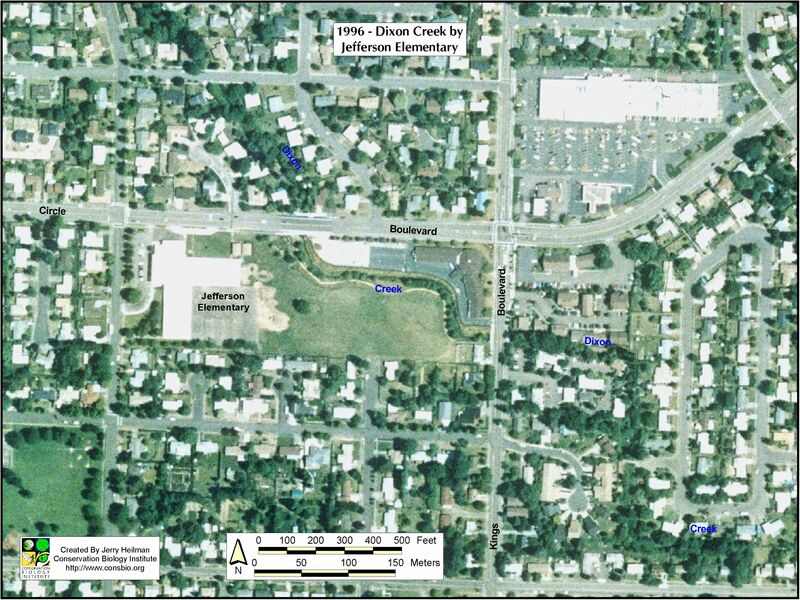 1996 air photo of Dixon Creek near Jefferson Elementary School. 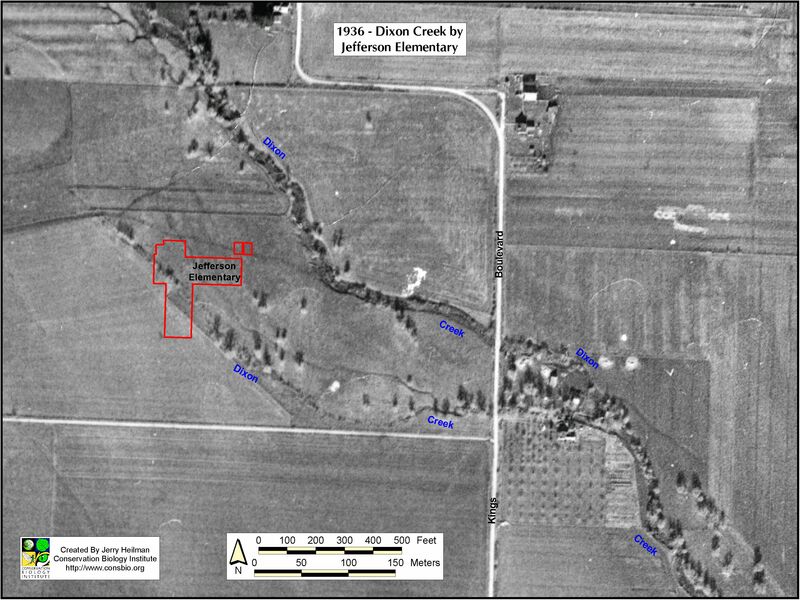 Vegetation, especially trees, have grown substantially and most portions of Dixon Creek in this photo are again shaded by trees. Notice that the final undeveloped area in the upper left has been built on. 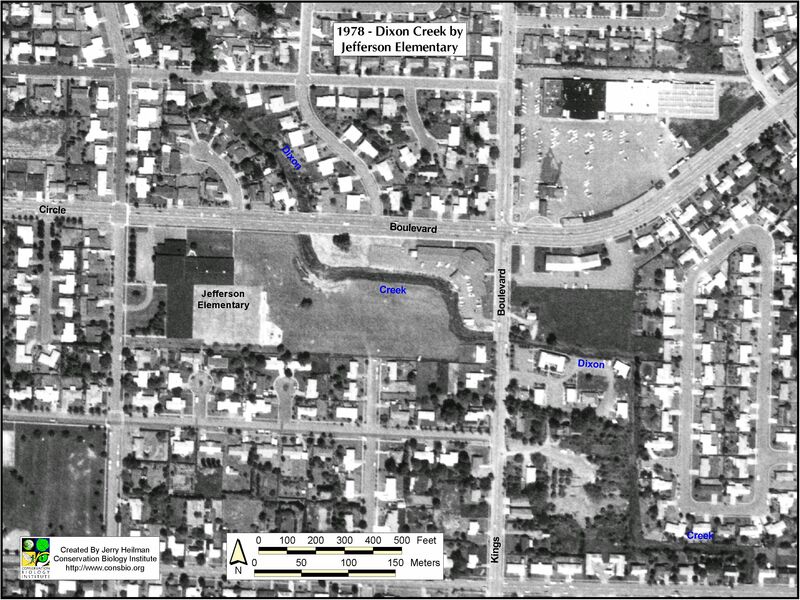 2002 air photo of Dixon Creek near Jefferson Elementary School. Continued growth of trees and stream side vegetation while the rest of the area is fairly stable since all lands have been developed. 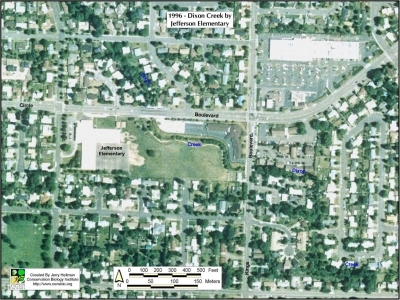 2004 air photo of Dixon Creek near Jefferson Elementary School. 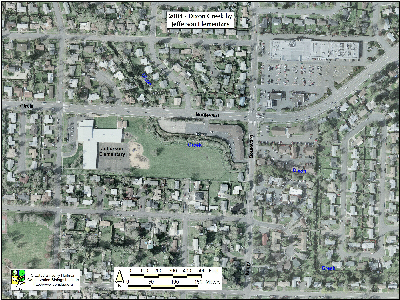 The biggest visible difference in this image is the trees along the road on the west side of the school have been removed. If you look at the high resolution 2002 and 2004 air photos, you can see changes in the creek's channel located on the very eastern portion of the creek on the school property.